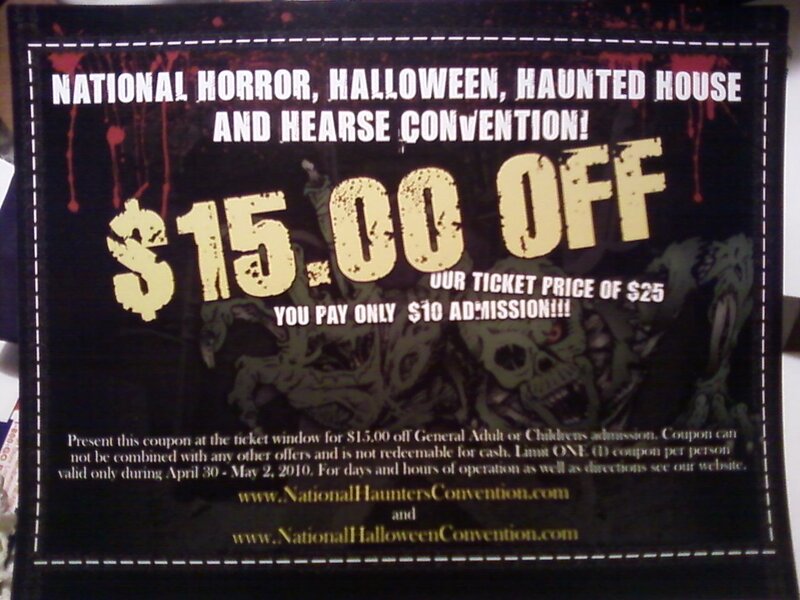 I first mentioned here about my appearance at the 2010 National Haunters Convention. As promised, I have some coupons now ready for you to request from me, if you would like to go and want to save a hefty $15.00 off the $25.00 admission price. Below is what the full-sized and full-color coupon looks like. There are 40 of these coupons available. I do have another 40, but will be using those at my discretion in other ways. So, be one of the first 40 to request one and I’ll mail it out to you Free of charge to your home. I can’t guarantee that it will be mailed out in a week or even the next month, but I promise you that you will have it prior to the convention. To request a coupon (you can request up to 2 per address), simply email me (ty_schwamberger@yahoo.com) with a subject line of ‘Coupon Request for NHC’ and include your full name and mailing address in the body of the email.